with fancy light effects and Bluetooth link to your smartphone. combines the art of juggling with mobile technology by connecting your smartphone to the juggling balls via Bluetooth Smart. You can control the color effects of the glowing balls and share your juggling achievements with your friends. The mobile app includes many more features such as games, battles, statistics and tutorials. Connect up to 7 juggling balls to your smartphone via Bluetooth Smart and start sharing your juggling activities and achievements online with your friends. Compete with your friends in several juggling games and meet different challenges to obtain achievements and unlock new features and games. 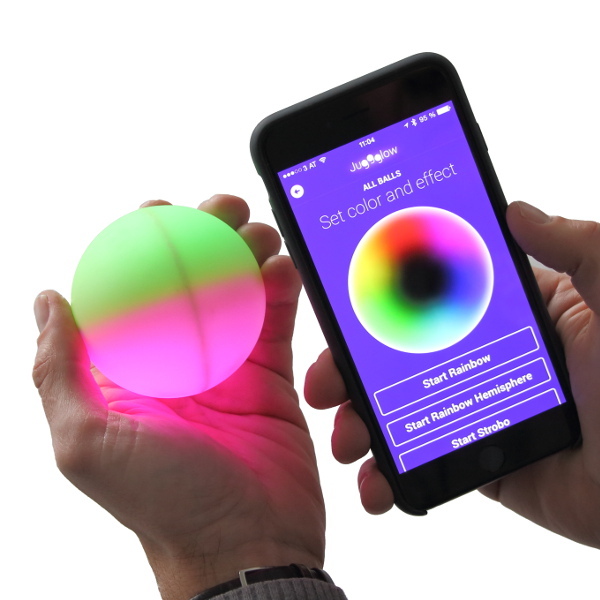 Integrated super bright LEDs make the balls glow in any colors, which can be set by the smartphone app or by motion sensing. Improve your juggling skills with the help of juggling tutorials and statistics of your juggling activities such as catching and fall counters. Juggglow pushes the traditional old beanbags to the next level of fancy glooming and wireless linked juggling balls. Therefore, we integrate the newest wireless technology, acceleration sensors and microprocessor intelligence in our juggling balls. On the one hand Juggglow can help beginners at any age to learn and practice juggling. On the other hand Juggglow can pimp your professional juggling performance with various definable color and gloom effects. An easy to use application for your mobile phone or tablet lets you interact with your juggling balls e.g. by choosing any color or visualization effects. Furthermore, you can play with or compete with your friends in many different challenges and battles. The players juggle in turn. All successful throws are counted until the player makes the first mistake. This number represents the value to be beaten by the next player. The players that can’t beat their predecessor get a penalty point. If players reach a defined maximum of penalty points they are excluded from the battle. 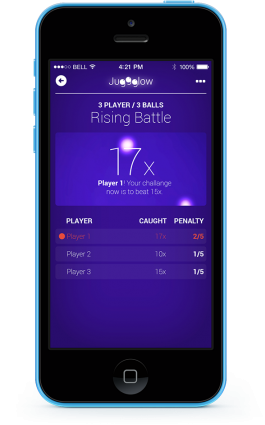 In each round the players have to juggle a certain period of time, which is randomly chosen by the app. If players drop a ball or juggle too long or too short, they get a time penalty. The player with the least time penalty wins the game. While juggling, the player has to throw the balls in different heights, which are requested by the smartphone app via voice output. If the requested height is not reached within a certain amount of throws the game is lost. The player with most throws at the correct height wins the game. The Juggglow app includes a fancy achievement system with more than 100 challenges to improve your juggling skills. Several funny challenges will help beginners to learn juggling in an easy way. But also intermediate and professional jugglers will get one’s money’s worth. And to reach the title “God of Juggling”, you have to conquer nearly impossible tasks. The acceleration sensor of the balls will be used to measure the catching and dropping impulse, flying time and height, and the spin of the balls. 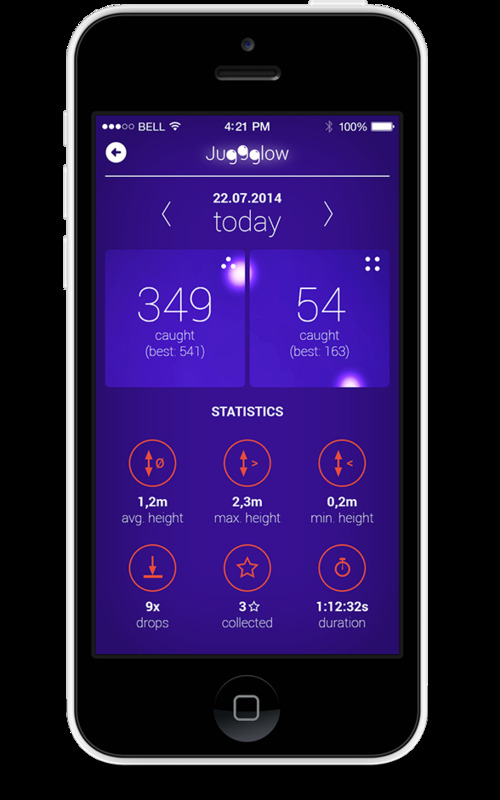 With this information the Juggglow app can analyze your juggling activities and illustrates your statistics in several diagrams such as your best daily juggling results or your average height deviation. All prices include taxes, but exclude shipping fees. Orders are no longer possible because all balls are sold out! The Juggglow balls are developed by the research group Embedded Systems in close cooperation with the Bachelor’s Degree Program Hardware-Software-Design and the Master’s Degree Program Embedded Systems Design. The research group at Hagenberg Campus belongs to the research area Information and Communication Systems of the University of Applied Sciences Upper Austria. The Juggglow balls are made in Austria.